Small, private and unique to the area, this historic guest ranch in northern New Mexico is nestled in the heart of the Sangre de Cristo range of the Southern Rockies, bordering the Santa Fe National Forest. 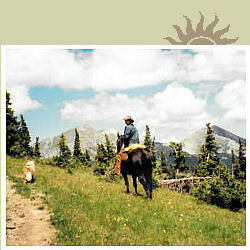 A profusion of wildflowers and many species of birds and animals abound in the sub-alpine setting. Average summer temperatures are 76 at midday, dipping into the 40's at night. The refreshingly clear mountain air provides wonderful nighttime stargazing. Los Pinos Guest Ranch recaptures the serenity and ambiance of an earlier, simpler time. Originally built as a summer residence, the main lodge shares its origins with New Mexico statehood. 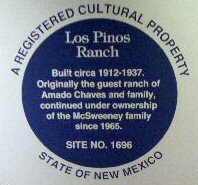 Since 1912, Los Pinos has been a relaxing haven for its visitors. Open From June 1 through September 30.